1908 One Peso, Pattern or Fake? I have just discovered a unique specimen struck in a carbon like planchet of a 1908 – S One Peso. 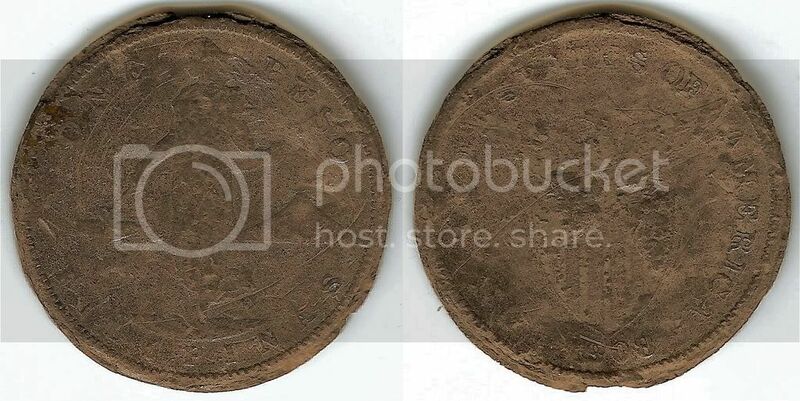 I have tried doing some research about this piece and even consulted some fellow numismatist regarding its discovery but I have not heard any consistent opinion regarding its authenticity except for the fact that there are several trial strikes documented by U.S. Numismatist also in the form of lead alloy but not this kind of material. This is a very unique specimen if its authentic since there were no reports of coins struck using this type of material. I thought it was made out of lead when I first saw it but with careful analysis, I have figured that the metal is similar to that of pencil lead. It is light, non-magnetic, smooth, but surprisingly it is very hard. If this is a forgery then how could the forger made this coin using such minerals or metal if his intention is to use this coin for trade since there are so many metals such as brass that can be easily manufactured in large quantities. Previously reported lead counterfeits were either from the early 1930's and during the 1940's mostly of lower denominations starting from five centavos up to fifty centavos. However, there is a reported 1919-S lead auctioned by Cookie Jar Collectibles in August 30, 2005. The coin is listed as Lot No. 525. Such counterfeits are very rare. Other dates of the same denomination that were also reported struck in lead includes 1944-S and 1945-S. This amazing specimen is a very rare type of coin since the material used was very difficult for minting coins, the hardness of the material made it very difficult to shape. The edge of this coins shows there are gaps between the coin's face and its edge while the legends, date, and letters are weak. It seems that the die was soft when struck and only hardened when it cooled down.